Download "Goal 2: Achieve Universal Primary Education"
1 92 Goal 2: Achieve Universal Primary Education In eight economies in the region including a number from the Pacific, total net enrollment ratios in primary education are below 80%. Eleven economies including several from the former Soviet Union have achieved expected primary education completion rates of at least 95%. In most economies for which data are available, over 95% of year olds are literate. In economies with lower literacy rates, women are more likely to be illiterate than men. Introduction The target is to ensure that, by 2015, children everywhere, boys and girls alike, will be able to complete a full course of primary schooling. Primary education usually starts at 5 or 6 years and continues through to 11 or 12 years, but age requirements differ between countries. To achieve this target, first, countries need to ensure that all primary school age children are enrolled in school; second, that they all complete the course. In the commentary below, the progress made by economies for these two components are considered separately. While in principle the goal is to achieve universal primary education, in practice, a rate of 95% and above is considered as a sufficient approximation. One test of the success of primary education is provided by literacy rates for persons in the age group. These rates show how well the basic reading and writing skills learned in primary school have been retained at the time young persons are either joining the work force or entering higher technical or university education. Key Trends Total net enrollment ratio is generally good but eight economies have ratios of less than 80%. Figure 2.1 shows 36 economies with total net enrollment ratios in primary education. The indicator includes children of primary school age who are enrolled in secondary education. Economies with enrollment ratios of less than 80% are denoted by red bars and include a number from the Pacific. Enrollment ratios in these economies would need to rise by about 2% 5% per annum from their latest levels to reach 95% by Fifteen economies (including Indonesia) had enrollment ratios of at least 95% in Nine of the other 21 economies including a number from the Pacific have seen their enrollment ratios fall. The falls have been particularly steep in the case of Cook Islands and Marshall Islands. Figure 2.1 Total Net Enrollment Ratio in Primary Education Kiribati Taipei,China Samoa Kazakhstan Korea, Rep. of Tonga Indonesia Mongolia Malaysia Tajikistan Maldives Sri Lanka Brunei Darussalam Palau Azerbaijan Hong Kong, China Georgia India Fiji Islands Viet Nam Armenia Uzbekistan Kyrgyz Republic Philippines Bangladesh Cambodia Vanuatu Lao PDR Bhutan Nepal Nauru Cook Islands Marshall Islands Pakistan Timor-Leste Solomon Islands Source: Table 2.1. 2 Goal 2: Achieve Universal Primary Education 93 Eleven economies out of 30 have expected primary completion rates of at least 95%. Figure 2.2 shows how many of the children who have enrolled in the first grade of primary education can be expected to reach the last grade for 30 economies. In 2006, 11 economies (denoted by green bars) had expected completion rates of at least 95%. They comprise several countries from the former Soviet Union. The expected completion rates for six of the other 19 economies fell during the period. Note that the data shown here are expected rates and not actual completion rates. Actual completion rates may turn out differently as they are affected by economic conditions. In particular, when times are hard, some parents may no longer be able to keep their children in school. Figure 2.2 mostly refers to pre-2007 data and so does not reflect the global economic crisis; this will only show up when data for 2009 become available. The goal of universal primary education requires that both the enrollment and completion criteria are met. However, completion of primary schooling will only be possible if children are able to reach the last grade. Hence, enrollment rates need to be considered alongside survival rates. Figure 2.2 Percentage of Children Starting Grade 1 and Reaching Last Grade of Primary Georgia Kazakhstan 99.5 Tajikistan 99.4 Hong Kong, China 99.3 Uzbekistan 99.2 Azerbaijan 98.7 Brunei Darussalam 98.2 Armenia 97.7 Korea, Rep. of 97.4 Kyrgyz Republic 96.5 Samoa 95.9 Indonesia 94.7 Sri Lanka 93.4 Viet Nam 92.1 Tonga 90.9 Malaysia 89.3 Bhutan 84.4 Mongolia 84.1 Kiribati 81.4 Fiji Islands 75.6 Philippines 73.2 Myanmar 72.7 Pakistan 69.7 India 65.8 Tuvalu 62.6 Nepal 61.6 Lao PDR 61.5 Bangladesh 54.8 Cambodia 54.5 Nauru Source: Table MILLENNIUM DEVELOPMENT GOALS Based on available data, only six economies have ratios of at least 95% for both indicators. These are Azerbaijan, Brunei Darussalam, Kazakhstan, Republic of Korea, Samoa, and Tajikistan. Other economies either miss one or both of the criteria or are able to provide statistics on only one or neither of them. 3 94 Goal 2: Achieve Universal Primary Education Literacy rates have mostly risen around the region. 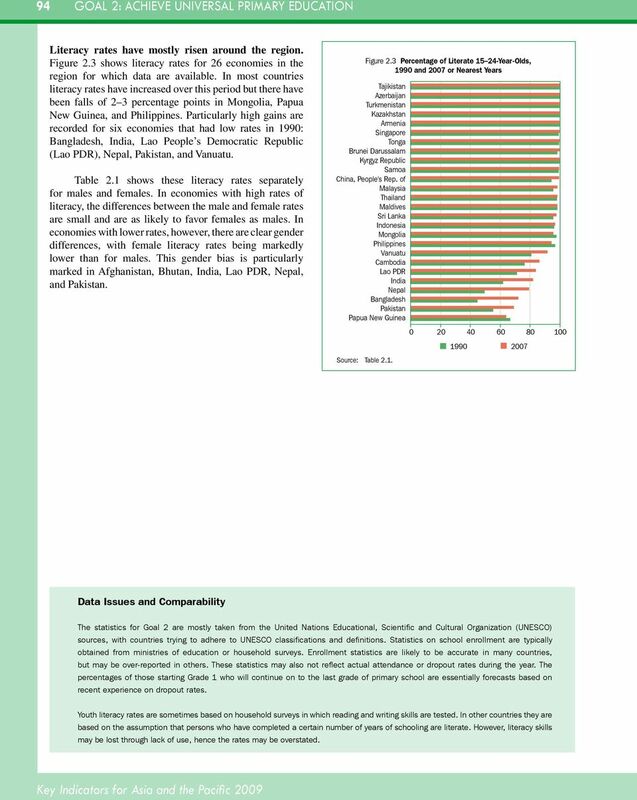 Figure 2.3 shows literacy rates for 26 economies in the region for which data are available. In most countries literacy rates have increased over this period but there have been falls of 2 3 percentage points in Mongolia, Papua New Guinea, and Philippines. Particularly high gains are recorded for six economies that had low rates in 1990: Bangladesh, India, Lao People s Democratic Republic (Lao PDR), Nepal, Pakistan, and Vanuatu. 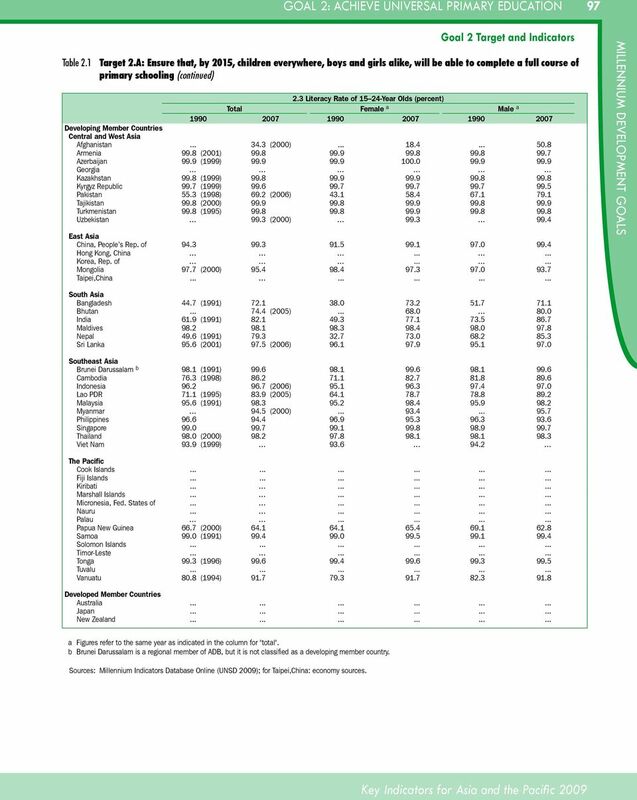 Table 2.1 shows these literacy rates separately for males and females. In economies with high rates of literacy, the differences between the male and female rates are small and are as likely to favor females as males. In economies with lower rates, however, there are clear gender differences, with female literacy rates being markedly lower than for males. This gender bias is particularly marked in Afghanistan, Bhutan, India, Lao PDR, Nepal, and Pakistan. 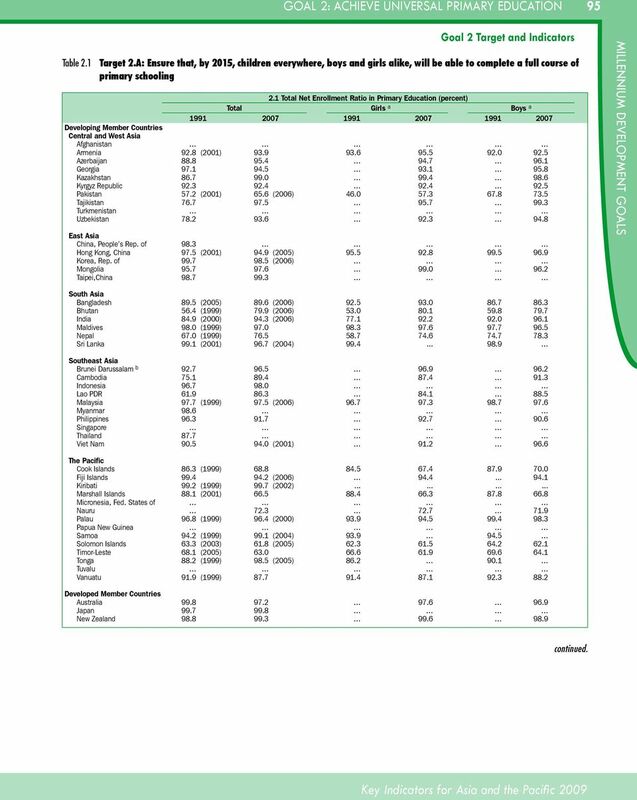 Source: Table 2.1. Figure 2.3 Percentage of Literate Year-Olds, 1990 and 2007 s Tajikistan Azerbaijan Turkmenistan Kazakhstan Armenia Singapore Tonga Brunei Darussalam Kyrgyz Republic Samoa China, People's Rep. of Malaysia Thailand Maldives Sri Lanka Indonesia Mongolia Philippines Vanuatu Cambodia Lao PDR India Nepal Bangladesh Pakistan Papua New Guinea Data Issues and Comparability The statistics for Goal 2 are mostly taken from the United Nations Educational, Scientific and Cultural Organization (UNESCO) sources, with countries trying to adhere to UNESCO classifications and definitions. Statistics on school enrollment are typically obtained from ministries of education or household surveys. Enrollment statistics are likely to be accurate in many countries, but may be over-reported in others. These statistics may also not reflect actual attendance or dropout rates during the year. The percentages of those starting Grade 1 who will continue on to the last grade of primary school are essentially forecasts based on recent experience on dropout rates. Youth literacy rates are sometimes based on household surveys in which reading and writing skills are tested. In other countries they are based on the assumption that persons who have completed a certain number of years of schooling are literate. However, literacy skills may be lost through lack of use, hence the rates may be overstated. 4 Goal 2: Achieve Universal Primary Education 95 Goal 2 Target and Indicators Table 2.1 Target 2.A: Ensure that, by 2015, children everywhere, boys and girls alike, will be able to complete a full course of primary schooling 2.1 Total Net Enrollment Ratio in Primary Education (percent) Total Girls a Boys a Developing Member Countries Central and West Asia Afghanistan Armenia 92.8 (2001) Azerbaijan Georgia Kazakhstan Kyrgyz Republic Pakistan 57.2 (2001) 65.6 (2006) Tajikistan Turkmenistan Uzbekistan East Asia China, People s Rep. of 98.3 Hong Kong, China 97.5 (2001) 94.9 (2005) Korea, Rep. of (2006) Mongolia Taipei,China MILLENNIUM DEVELOPMENT GOALS South Asia Bangladesh 89.5 (2005) 89.6 (2006) Bhutan 56.4 (1999) 79.9 (2006) India 84.9 (2000) 94.3 (2006) Maldives 98.0 (1999) Nepal 67.0 (1999) Sri Lanka 99.1 (2001) 96.7 (2004) Southeast Asia Brunei Darussalam b Cambodia Indonesia Lao PDR Malaysia 97.7 (1999) 97.5 (2006) Myanmar 98.6 Philippines Singapore Thailand 87.7 Viet Nam (2001) The Pacific Cook Islands 86.3 (1999) Fiji Islands (2006) Kiribati 99.2 (1999) 99.7 (2002) Marshall Islands 88.1 (2001) Micronesia, Fed. States of Nauru Palau 96.8 (1999) 96.4 (2000) Papua New Guinea Samoa 94.2 (1999) 99.1 (2004) Solomon Islands 63.3 (2003) 61.8 (2005) Timor-Leste 68.1 (2005) Tonga 88.2 (1999) 98.5 (2005) Tuvalu Vanuatu 91.9 (1999) Developed Member Countries Australia Japan New Zealand continued. 5 96 Goal 2: Achieve Universal Primary Education Goal 2 Target and Indicators Table 2.1 Target 2.A: Ensure that, by 2015, children everywhere, boys and girls alike, will be able to complete a full course of primary schooling (continued) 2.2 Proportion of Pupils Starting Grade 1 Who Reach Last Grade of Primary (percent) Total Girls a Boys a Developing Member Countries Central and West Asia Afghanistan Armenia 79.3 (2001) Azerbaijan Georgia Kazakhstan 95.9 (2000) 99.5 (2007) Kyrgyz Republic Pakistan 69.7 (2004) Tajikistan Turkmenistan Uzbekistan East Asia China, People s Rep. of Hong Kong, China 99.3 (2002) 99.3 (2004) Korea, Rep. of Mongolia Taipei,China South Asia Bangladesh 54.8 (2005) Bhutan (2005) India (2005) Maldives Nepal (2007) Sri Lanka 93.4 (2005) Southeast Asia Brunei Darussalam b 98.0 (2003) Cambodia Indonesia 85.9 (2001) Lao PDR Malaysia 97.7 (2002) 89.3 (2005) Myanmar 55.2 (2000) Philippines 75.3 (2001) Singapore Thailand Viet Nam (2005) The Pacific Cook Islands Fiji Islands Kiribati 69.7 (2001) 81.4 (2003) Marshall Islands Micronesia, Fed. States of Nauru 25.4 (2001) Palau Papua New Guinea Samoa (2000) Solomon Islands Timor-Leste Tonga 94.6 (2000) 90.9 (2005) Tuvalu 72.7 (2000) 62.6 (2001) Vanuatu Developed Member Countries Australia Japan New Zealand continued. 6 Goal 2: Achieve Universal Primary Education 97 Table 2.1 Goal 2 Target and Indicators Target 2.A: Ensure that, by 2015, children everywhere, boys and girls alike, will be able to complete a full course of primary schooling (continued) 2.3 Literacy Rate of Year Olds (percent) Total Female a Male a Developing Member Countries Central and West Asia Afghanistan 34.3 (2000) Armenia 99.8 (2001) Azerbaijan 99.9 (1999) Georgia Kazakhstan 99.8 (1999) Kyrgyz Republic 99.7 (1999) Pakistan 55.3 (1998) 69.2 (2006) Tajikistan 99.8 (2000) Turkmenistan 99.8 (1995) Uzbekistan 99.3 (2000) East Asia China, People s Rep. of Hong Kong, China Korea, Rep. of Mongolia 97.7 (2000) Taipei,China MILLENNIUM DEVELOPMENT GOALS South Asia Bangladesh 44.7 (1991) Bhutan 74.4 (2005) India 61.9 (1991) Maldives Nepal 49.6 (1991) Sri Lanka 95.6 (2001) 97.5 (2006) Southeast Asia Brunei Darussalam b 98.1 (1991) Cambodia 76.3 (1998) Indonesia (2006) Lao PDR 71.1 (1995) 83.9 (2005) Malaysia 95.6 (1991) Myanmar 94.5 (2000) Philippines Singapore Thailand 98.0 (2000) Viet Nam 93.9 (1999) The Pacific Cook Islands Fiji Islands Kiribati Marshall Islands Micronesia, Fed. States of Nauru Palau Papua New Guinea 66.7 (2000) Samoa 99.0 (1991) Solomon Islands Timor-Leste Tonga 99.3 (1996) Tuvalu Vanuatu 80.8 (1994) Developed Member Countries Australia Japan New Zealand a Figures refer to the same year as indicated in the column for "total". b Brunei Darussalam is a regional member of ADB, but it is not classified as a developing member country. 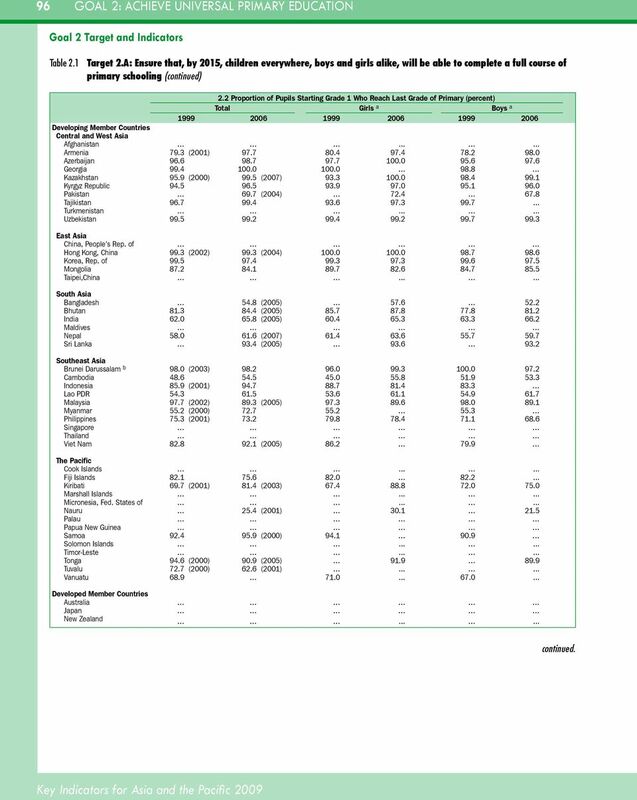 Sources: Millennium Indicators Database Online (UNSD 2009); for Taipei,China: economy sources.